Roll out pie dough or unroll pre-made dough. Cut dough into 2 1/2-inch circles. Prick each circle with a fork. Press dough into ungreased mini muffin tins. Bake dough in preheated oven at 350F degrees until golden, about 4 minutes. Sauté onion and kale in 1 Tablespoon butter. Mash potatoes, cheese and vegetables. If too dry, add remaining butter as needed. Whip potato mixture until smooth; season with salt and pepper. Put whipped potato mixture in pastry bag with tip; press mixture into crust lined cups. Garnish with a pinch of smoked paprika and a smoked almond if desired. Serve warm or at room temperature. 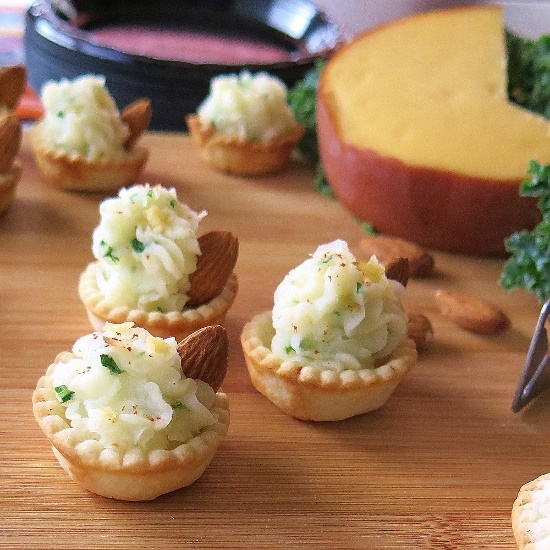 Elegant looking Smoky Potato Pie Cups are easy to make with a few simple ingredients. 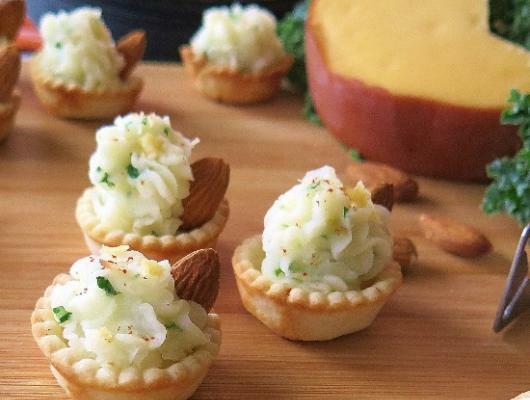 A great vegetarian appetizer.